We all have a phase in our makeup journey where we are attracted towards a certain brand or certain products like eyeshadow's, lipsticks or foundations and tend to buy them a lot. For me I am currently going through a blush phase and even though I have so many blushes in my collection I tend to buy more! Meet the culprit which was responsible for my craze towards blushes...theBalm's Blush in Fratboy!!! I got this blush at the start of this year and since then it has been my to go blush and I just cannot get enough of it! The first thing that you notice about all theBalm products is their attractive and retro packaging! I absolutely adore it! Its different than the usual black case packaging which we normally see in higher end brands with exception of Benefit. theBalm Blush in Fratboy comes in a square cardboard packaging with a tiny mirror inside. Although I would have preferred a full size mirror but something better than nothing..right? Another advantage of cardboard packaging is that its less prone to breakage and scratches! I have traveled with this blush in my handbag across countries and yet to face any problems! The blush retails for 21$ for whopping 8.5g which is higher than most of the higher end blushes in the market! Fratboy is a gorgeous peachy pink shade with a matte finish. The texture of the blush is satiny smooth with no fall outs at all. It is highly pigmented and I swipe of brush is enough to get natural flush on cheeks. The blush is incredible soft and looks very natural. On my combination skin it stays for 8+ hours which is truly amazing! 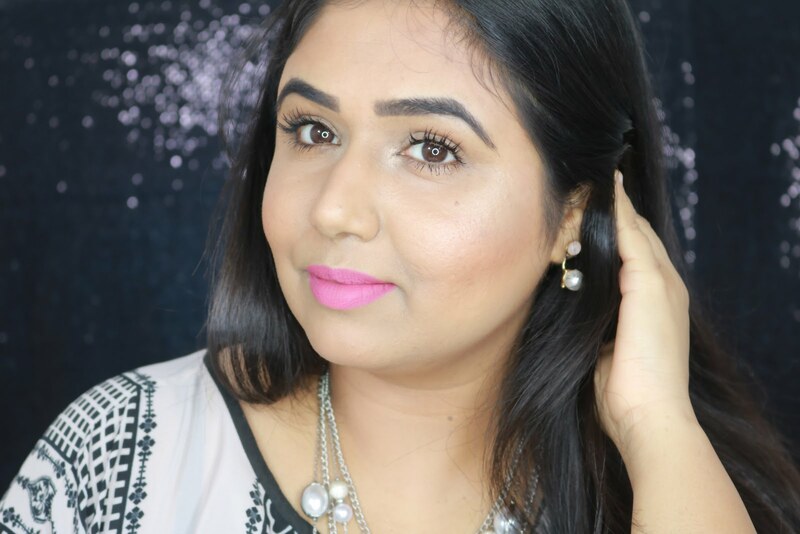 It blends beautifully on the skin without turning patchy or even. The shade is universally flattering and a must have if you love blushes! This is how it looks on my NC40-42 skin tone, I have Nars Sheer Glow foundation in Barcelona on face with MAC pro-long wear concealer in NW30 under the eyes. -> Cute and attractive packaging! -> Gives natural glow to cheeks! -> Versatile product and can be used for eyeshadow as well! -> Paraben and Cruelty free! I highly recommend this blush to everyone! Its a gorgeous shade and a total must have if you love sporting blushes! You can buy theBalm products from Strawberrynet or directly from theBalm website they do ship internationally! If you still haven't entered my giveaway then do so right now! the details are on top right hand side of the page where one lucky reader will win brand new theBalm's blush in Fratboy! it looks so fine & fresh on you!!! Oh wow... this is such a pretty shade. I think I will give it a try, as I don't have a soft peachy pink shade in my collection. Thank you so much Vipra! Suits u so well pari! N d shade is mouth watering..i wantt! This is such a beautiful blush. I'm always eyeing on it but always end up buying something else. Gives an amazing glow. Thank you Dr Neeraj! you should def get it!